Shalin P. Desai, MD, is a cardiologist with special clinical training in electrophysiology. He is board-certified in cardiovascular disease, clinical cardiac adult echocardiography, nuclear cardiology and internal medicine. 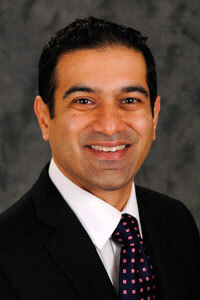 Dr. Desai is also board-certified for clinical cardiac electrophysiology. After earning a bachelor of science in civil engineering with minors in biology and psychology from The George Washington University, Dr. Desai obtained a master of science in physiology from University of Maryland. He earned his doctor of medicine and completed his residency in internal medicine, both at The George Washington University. Dr. Desai was awarded a cardiac surgery research fellowship at the Inova Heart and Vascular Institute at Inova Fairfax Hospital in Falls Church, Virginia, where he conducted a prospective clinical trial related to insulin therapy following coronary artery bypass grafting surgery (The SLIP Study). He subsequently completed a cardiovascular diseases fellowship that included intensive training in electrophysiology with the North Shore LIJ Health System, and a clinical cardiac electrophysiology fellowship at New York Presbyterian Hospital/Columbia University Medical Center.